Fall is here. The garden is pumpkin’ing out pumpkins & squash! Ha! We’re starting to have some chilly days here in Montana. 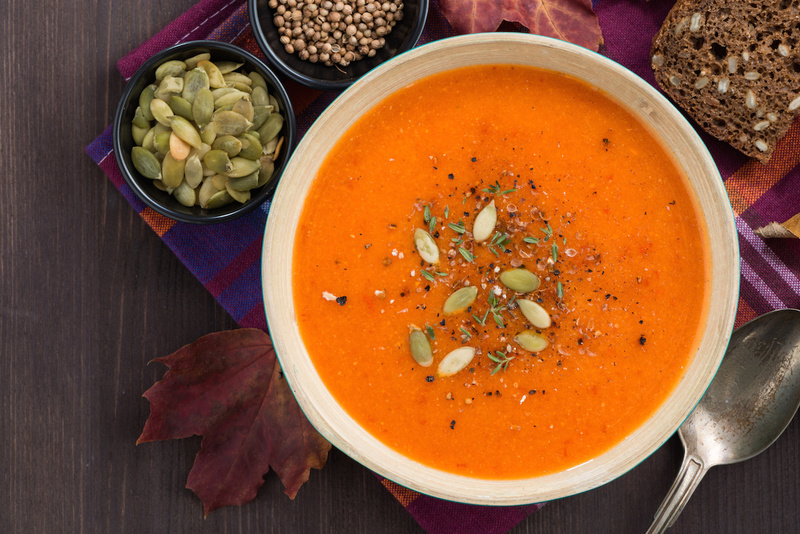 It’s feeling like fall and has me craving soup! I love love love soup for lunch! I still eat a lot of my fav soup ever – Spinach Soup – but now and then ya gotta change it up! I know we all need our pumpkin fix this time of year so here’s a simple pumpkin bisque. It only requires a few ingredients, a blender, and maybe 10 minutes. Enjoy this gluten free, dairy free, easy soup! A touch of cloves would be amazing too, and cloves have a super high ORAC value, meaning cloves have a lot of anti-oxidants to offer! If you have a Vitamix- use the hot soup setting, it will blend and heat all at once. With a traditional blender, blend the ingredients then add the pureed mixture to a soup pot and heat over medium heat only until warm enough that it will taste great! (~5 minutes, stirring frequently).